The unprecedented growth of technology has opened new avenues of mobile app development. With 64% of people’s mobile time spent on apps, it has become critical for businesses to include a well-built app within their organization. In fact, a study conducted by Google along with Ipsos OTX revealed that 81% of smartphone users prefer accessing the internet through their mobile devices. Hence, to leverage the most out of these technical opportunities, it is imperative for businesses to go for mobile app development. However, mobile app development isn’t as easy as it looks. If you do not possess thorough knowledge about the development process, there are ample chances of your mobile app development getting plagued with disasters. Did you know that 59% of app fail to achieve its goal because of certainly avoidable blunders? Would you want to repeat the same mistakes? Would you wish to lose out to your competition? Definitely no. 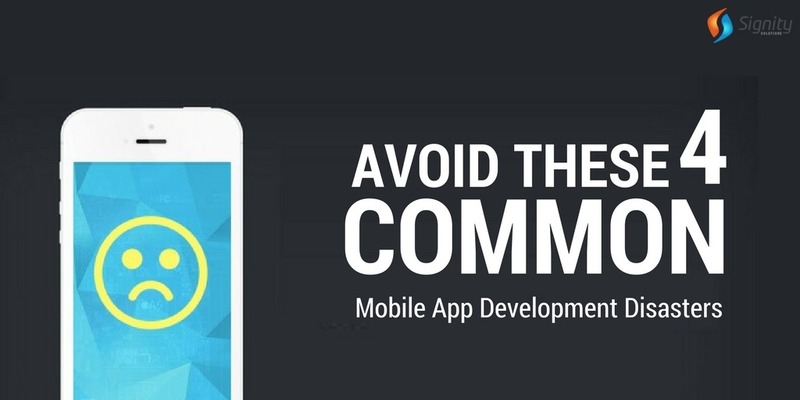 Hence, it is vital to get hold of the below-mentioned common mobile app development disasters and avoid it in order to develop a top-notch app for your business. Ambiguity regarding the platform: One of the biggest mistakes during mobile app development is being ambiguous regarding the platform you need to build your app on. It is critical to keep in mind the compatibility of your app with the desired platform and failing to do so results in disasters. Both Android and iOS platforms function differently which might lead to certain errors and challenges in the functioning of the app. This could be a major reason for your app’s instant failure. Hence, make sure that you have made an in depth research regarding the platform you are using, which primary platform does your target audience/location uses, test it across various platforms, fix the bugs beforehand and choose the platform that best suits your app irrespective of it being an Android or an iOS. Directionless investing: It should be kept in mind that merely investing in an app isn’t going to make it successful. If you do not channelize your investments in the right direction, you could end up having a disaster in mobile app development. Time and money are an integral part of app development. Hence, have a precise and clear vision about what you are expecting out of your app. What goals and objectives you wish to achieve? How can you enhance the user experience of the app? Interact with your developers regarding the same so that they can develop a seamless mobile app which offers long-term value as well as quality and your investment doesn’t go waste. Incorporating features that don’t appeal to masses: No matter how cliché it sounds but, the truth is an excess of everything is dangerous, indeed. In quest of developing a high-end app, businesses often end up including a clutter of unnecessary features in their app. 2% of users might find it good but, there are chances of 98% of users despising it. Irrelevant features wouldn’t only increase your expenditure unnecessarily but, also make your users unhappy. Would you want your users to abandon your app? If the answer is no, make sure to add only relevant and useful features within your app. Launching the app without pre-testing: You should never ever launch your app without being 100% sure about it. If the first impression of your app turns out to be bad, it’s going to damage your brand value considerably. There are a plethora of examples where people have launched their app without pre-testing and have ended up facing the brunt of failure. You definitely wouldn’t want to be one amongst them, would you? Therefore, it is vital to do an extensive analysis of your app’s compatibility, functionality, and quality. Once you are convinced that you are the app is good to go post testing, announce the launch. The above-mentioned points are some common disasters that businesses do while doing their mobile app development. Hence, it’s vital to keep these points in mind during your app development along with ample insight into the market trends, customer behavior, their needs, and preferences so that you develop an app that can help you climb ladders of success. Looking for a mobile app development team? Want to build an error-free, intuitive, feature-oriented, world-class app for your business? Signity Solutions can be your one-stop destination then. Our dedicated team of developers work extensively to understand your vision and requirements and accordingly create a well-built, seamless and functional app for your business. For any queries, drop us a line at sales@signitysolutions.com. We will reach out to you instantly.